Signing up for new POS software can be an exciting time for your business. But once the honeymoon is over, issues that you didn’t see before can rise to the surface. This can obviously be very frustrating, but good to know for next time. 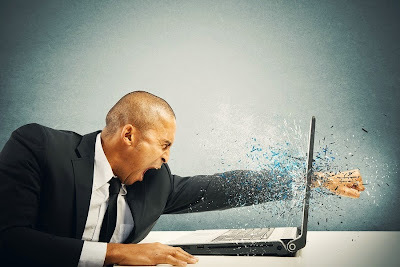 Discover 8 reasons why you might hate your POS software and how to avoid them in the future! Discover 8 reasons why you might hate your POS software and how to avoid them in the future! Do you hate your POS software? Symptoms include, but are not limited to, IT headaches, extreme frustration, and a strong urge to make a phone call containing expletives to the company in question. In all seriousness, the wrong POS software has the potential to result in crippling costs, lost productivity, and unhappy employees and customers. Make sure you don’t get stuck with a bad one! Cost is arguably one of the most important considerations for small business owners. While it’s easy enough to shop around for a good deal initially, many companies promote misleading prices or offer packages with confusing pricing structures. On top of this, there are often hidden fees and charges the user may not discover until it’s too late. It’s fair to say that most of us will require customer support at least a couple of times each year - even those of us with the fanciest POS software. The reality is that despite paying thousands for POS software, many users are offered a lousy service, service that requires unreasonable fees, or no service at all. Cost - Ensure that support is free or at least a price that you’re willing to pay. Availability - Do you require 24/7 service or will normal business hours suffice? Method - Do they offer support via your preferred method? For example, telephone or live online chat. Friendliness – Try making a sneaky call to the support line before committing, just to make sure that the operators are friendly and easy to talk to. Good POS software is designed with the user experience in mind. If your software is not suitable for your least technical member of staff, it is not suitable for your business. An unintuitive system will lead to time and productivity loss, frustration, and potentially extra money spent on customer support. How to avoid: Test, test, test. Make use of the free trials that most companies will offer and have a cross-section of your staff test them out, too. Create a list of everything you require from the software and test each function’s usability thoroughly. Keep looking until you find the most efficient product for your business. Security is often neglected when choosing POS software (let’s face it; it’s a lot more fun to focus on the exciting features!). However, small to medium business owners should be very concerned about this item – hackers are aware that small businesses often lack the funds or knowledge to invest in systems that prevent credit card hijacking. How to avoid: Your prospective company should be able to provide their security policy and details. Read it. Then conduct a thorough search online to ensure the company in question has a solid reputation for security. You may even want to speak to or hire an expert to consult on the matter. While a lot of POS software is designed for specific industries, no business is exactly the same and it’s still possible to be left without the features you need. Imagine you run a bar and discover there’s no option to implement a happy hour menu within your system? As with any technical product, some companies provide cutting edge technology, while others lag behind and become dated. Systems that are slow to operate and contain lots of bugs are going to frustrate you, your employees, and your customers. In more serious cases it can even lead to crashes and data loss. How to avoid: This is a tough one, because bugs don’t always show themselves in the usually small window you’ll have to trial the product. Turn to online reviews and scour them for comments relating to performance and bugs. It is also worth reviewing your contract before signing to ensure that poor performance will allow you to cancel free of charge and without legal action. We all know the value of a good contract, but at the end of the day, this isn’t a marriage and you shouldn’t have to suffer with a company that isn’t delivering. Whether your once great POS software has simply become outdated or the customer support has taken a turn for the worse, you should be free to leave as soon as you’re no longer happy with the service. How to avoid: This is an easy one; don’t sign a contract if you think the length of commitment is too much. There is no reason for a company to lock you in for an uncomfortable amount of time. This smells of insecurity and a lack of confidence in the product. There are now plenty of highly reputable POS software companies that don’t require any contract at all. Some big costs can appear out of nowhere if you find yourself stuck with a company requiring you to purchase specific hardware or software in order for their product to integrate efficiently. If you already have existing hardware, this can be a huge problem. Help us add to this list! What do you hate about your POS software? My pet hate is systems that don't integrate to other systems! It's so unnecessary in this day and age to be exporting files or stuck with endless reconciliations.